At Dave and Amy English School, we used to have popular, effective Mommy and Baby lessons. 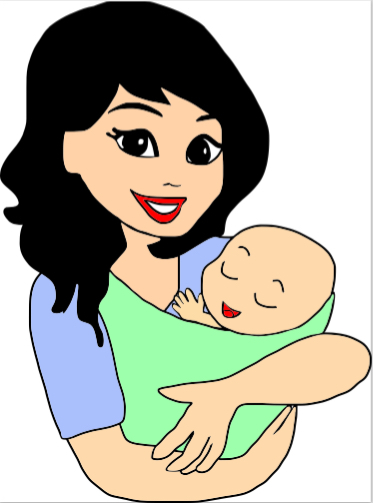 14 - 18 Moms and young children would come to the weekly lessons. Before kindergarten, students could usually say their name and age, answer basic questions and knew a lot of vocabulary. 1. Who: Any child from the age of 6 months to pre-kindergarten. Of course if a mother had a 3 year old and a 2 month old, both children were welcome. Notes: We had no problems with the big age gap because the younger children would look up to and copy the older children. And soon be older themselves “teaching” younger children. 2. When: 10:00 - 11:00 any weekday morning (except Wednesday). Why 10:00 - 11:00? Because Moms don’t like to be rushed. 9:00 too early and 11:00 too near lunch. Also, if Moms DO have older kids in kindergarten, then it gives them time to take the older kids to kindergarten and then come to your lesson. Why not Wednesday morning? Because many kindergartens have half days on Wednesday mornings. And Moms with kids in kinder will either be rushed or not able to come. 3. How much: 5000 yen / month for 4 lessons. We started with a pay when you come fee. But found that rain/ hot / cold, slight fevers..….ANYTHING basically would put Moms off coming. So attendance (and our money) would vary from 3,000 yen to 20,000 yen depending on the weather. A monthly fee ENCOURAGED Moms to COME. And of course, we WANTED Moms to come, because the more often students came, the better they got. 10:00 - 10:25: Come anytime. Children play (with a few hardy toys). Moms/ Teacher (and children) talk. Why come anytime? We found that Moms with young children often find it difficult to be on time. So, there was no ON TIME. You could come at ANY TIME. Some Moms took advantage of the full 25 minutes. Others, only half. Why is the real lesson only 30 minutes? Because 30 minutes is a LONG time for young children. And it is enough. A full HOUR lesson is too long. Don’t Moms feel they aren’t getting a full lesson with 25 minutes of play time? To the contrary, Moms enjoyed the time to chat—-in English or Japanese with the teacher and other Moms. And the teacher would interact with the children as they played. Encouraging natural English. Why not just do a 30 minute lesson and skip the play time? Because getting out of the door is an effort for a Mom with young kids. If the full time is only 30 minutes, many Moms might think it not worth it. Any Dads? Of course. We had several Dads. And grandmas. And grandpas. 10:25 - 10:30. Clean Up the Toys. Put them ALL away and out of sight—-so that the children will not be distracted in the lesson. We did a mixture of songs (sitting down and standing up), toy box and books. For the most part, children were engaged the full 30 minutes and participated. Make a Circle: Big/ Small / Tall / Short/ Noisy / Quiet….. Stand up: Sing a song. Sit down. Do the toy box. (Children say the word and get the toy.) Younger children DON’T get as many toys usually —- but they are listening and learning and will soon be competing with the older kids. Read books. Get the Moms and kids close. Let the kids choose which book by pointing. We liked to begin the books with a few versus of the chant (Clap, Clap, Clap your Hands as Slowly as you Can…) Then begin the book. Paraphrasing. And having kids repeat. Ask questions about the book: What color…. ? Do you like ….? How many …. ? Sing the good - bye song. Next week, we’ll go through why we STOPPED the Mommy and Baby lessons (despite their success).